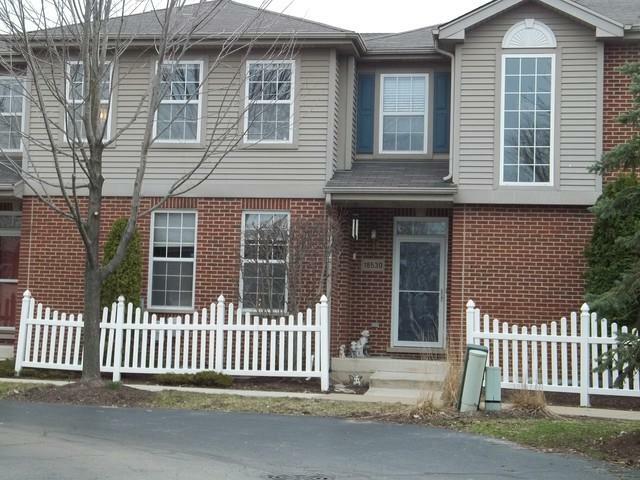 Beautiful townhome in a wonderful subdivision!! Enjoy 3 scenic ponds, a walking trail and easy access to I80, the Metra station, Pace bus, shopping and dining! The exterior boasts a 2 car garage and a private courtyard area with concrete patio! The well maintained interior features 9 foot volume ceilings, neutral decor and NEW window screens! The main floor has an open floor plan with refinished hardwood floors, a formal Living room, Dining room and a spacious Kitchen! The eat-in Kitchen offers oak cabinets, a pantry closet, patio access, a dishwasher, garbage disposal and kitchen sink faucet Step up to the 2nd floor which has new carpet, a Loft, large linen closet, shared bathroom and 2 spacious bedrooms! The Master bedroom has a tray ceiling and walk-in closet! Looking for additional living space? you can finish the full basement! You must see this one before it's gone!